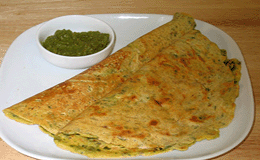 A very healthy and tasty rotis what u can serve with achaar,mint sauce,sabzi or even with fried fish. Mix all the ingredients together and knead with milk.Leave it aside for 15 minutes. Make equal balls out of then roll it to make flat rotis out of it.Apply dry gram flour to make rotis. Now roast it on a pan and apply ghee and roast it until it turns into golden colour. Delicious baisni rotis are ready to be served. This was so tasty, healthy too. Thanks Salma. Hi Salma. Great recipes coming from you. This is also known as Missi Roti. Thank you very much Salma ji for this nice recipe. ASAK Salam thanks 4 sharing.